Research published today by the Institute of Race Relations shows that recently arrived migrant workers are vulnerable to exploitation and xenophobic attacks. 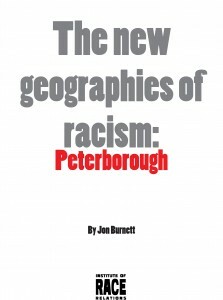 The new geographies of racism: Peterborough, focuses on a city which has experienced significant population change over the last decade, largely as a result of the expansion of the European Union and the migrant workers who have found employment in the city’s factories and agri-business industries. These same workers have been vilified as overrunning the city in a succession of national media investigations, yet today’s report finds that in fact there has been a range of violent attacks, largely unrecognised, against migrant workers and other BME communities. Exploited migrant workers, forced in the most extreme cases into destitution, have been bullied, harassed and attacked. Yet police and UK Border Agency (UKBA) operations aimed at removing them from the country have led to an unwillingness to report this violence to the authorities. Asylum seekers dispersed into the city have been targeted and in the most serious examples forced from their homes. Some politicians are accused of exploiting concerns over immigration for political gain. Attempts by far-right groups to exploit the murder of a white teenager by Asian men were repelled by local community activists. Notes to editors 1) Dr Jon Burnett is a researcher at the Institute of Race Relations. 2) This is the third of three reports investigating changing patterns of racial violence in the UK. The first of these reports, on the city of Plymouth, can be downloaded here: The new geographies of racism: Plymouth. The second, on the city of Stoke-on-Trent, can be downloaded here: The new geographies of racism: Stoke-on-Trent. 3) The IRR’s Racial violence: the buried issue, published in 2010, can be downloaded here. 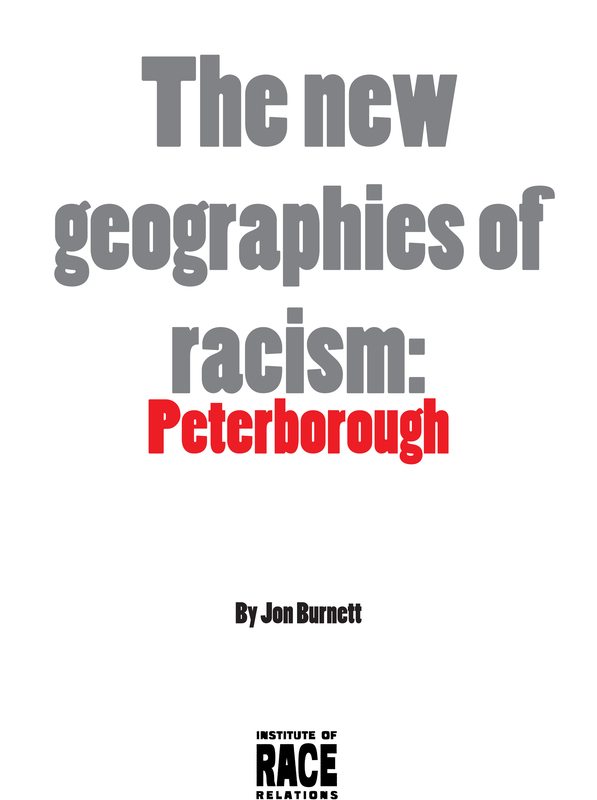 4) Read the IRR’s research, The new geographies of racism: Peterborough here (pdf file, 384kb). 5) For further information call the IRR on 020 7837 0041 or 07753 741 129 or email: jon@irr.org.uk. Having completed part of my training as a junior doctor in Peterborough (F1 & F2 years), I must comment that the huge influx of migrants into the city, many with very limited English language skills, has placed enormous strain on public services. Many Poles (a Free Polish paratrooper regiment was based nearby) and Italians immigrated to Peterborough post-war and integrated very well. However, such are the numbers that the city has received recently that the local population feels overwhelmed and previously safe areas (such as the Lincoln Road) have become no-go areas, especially for lone women. It is true that a proportion of these immigrants have fallen victim to slum landlords and unscrupulous employers and I do not endorse or seek to excuse victimisation of the migrants, however the impact of unfettered migration to the city has been a significant dis-benefit to the existing population. My views and frustrations are commonly held amongst my NHS peers in the Peterborough area. I am a doctor working with migrants in London. In my experience, migration and diversity is a problem only when the healthcare services refuse to acknowledge and provide for the needs of the community they serve. In the various London boroughs there are examples of good provision (e.g. in Newham and Tower Hamlets) where (to take one example) interpreters and advocates are provided so that doctors and patients can communicate. In other boroughs, this is not the case and medical staff become frustrated. Perhaps the role of NHS staff should be not to grumble about migration, but to pester their managers for adequate provision of interpreters, language classes etc? Diversity does not necessarily have to be a problem in medicine. Working with migrants has enhanced my communication skills, helped me realise what goes on elsewhere on this planet, and has added to the richness of experience I gain from my work. If the anonymous doctor is able to spend more time talking with his/her migrant patients, s/he may find the same thing. Finally, migrants are often resourceful and active people who survive adversity and go on to set up their own businesses, support others in their community, volunteer, etc. They also often help to solve or relieve the problems in their countries of origin, e.g. by working and sending money home to relatives, thus assisting the local economy, educating their families,etc. The negative view of migrants as purely negative consumers of public services needs to be challenged. I am also a junior doctor. I trained in London with attachments in many places that also have attracted migrants over recent years – Enfield, Tottenham, Luton, etc. I have to say that I don’t recognise the account that my anonymous colleague presents above. It is also at odds with what limited research there has been on this topic – e.g. http://www.lho.org.uk/download.aspx?urlid=11948&urlt=1 and http://www.nat.org.uk/Media%20library/Files/PDF%20documents/Myth-of-HIV-Health-Tourism-Oct-2008.pdf. I believe most of my peers enjoy living and working in vibrant multicultural communities. Most recent migrants to the UK are a consequence of the expansion of the EU. These are mostly young healthy people who are working and paying taxes. That we are unable to provide healthcare to new members of our communities – in particular interpreters – is an indictment of NHS management and inflexible Department of Health budgeting rather than immigration policies. The account above also neglects to mention the enormous contributions to the NHS made by migrant workers – doctors, nurses, auxillaries, porters, etc – over the years. Thank you Naomi and Tom (above) for speaking of the positive narrative of migrants contributing to our society. Such interactions occur regularly but often go unaccounted for in public discourses. Thanks for daring to speak out on behalf of the sometimes voiceless migrants! I am a GP in London, working in an inner city community which is diverse and in a constant state of flux. There will, at times, be frustrations as services try to adapt to demands with limited resources but this will occur in many situations (not just migration) with our changing political and economic climate. As a doctor, I feel I have a duty of care to all my patients, no matter where they originate from. For the record, both EU citizens and asylum seekers are entitled to healthcare and it is worrying if they are too scared to seek help. Even if you ignore the moral and ethical reasons for providing adequate services, it is more economical to prevent or treat illness earlier. I think any frustrations that the anonymous (or any other) doctor has would be better directed towards (mis-)management and the politicians for using migration as a point-scoring area for their own political gain. In some cases, migrants were directed by government agencies to fill jobs in the Peterborough area which the locals were unable/unwilling to do (eg agricultural labour). Unfortunately, it seems that the planning didn’t extend to adequate funding of the services in order to support the population. To lay the blame at the feet of migrants is unfair and adds fuel to the fire of the prejudice that already exists and can have damaging consequences as documented in this report. Just to add to earlier comments , we must not forget that Europe progressed as a result of migration , I think it is also important to understand what forces people to migrate in order to build empathy towards them. Basically the burden of ill-designed migration policies should not be thrust on existing migrant populations.This takes us back to the adage ” Necessity is the mother of invention” ,the pressures created by an aging society and the shortage for care workers in UK may very soon lead governing bodies to revise existing policies in favour of selective immigration perhaps. I applaud the fact that many White Middle class people will stand up for the rights of the often dispossessed immigrants coming into Britain, but when will those same concerned Middle class people be concerned about the dispossessed Working classes already living here? The reality of immigration for the Middle class is largely academic, something they can champion from their ivory tower as long as the reality doesn’t get too close to them. Immigration into Britain really boils down to one thing; people doing very low-paid dead-end jobs that the indigenous population don’t want to do. It’s also a way of keeping wages low. Of course if you’re Middle class, this doesn’t really affect you one way or the other, with high paying careers. Let’s have a little bit of much needed truth on this issue, instead of the usual PC Middle class pronouncements please! Nadia, you wrote: ‘To lay the blame at the feet of migrants is unfair and adds fuel to the fire of the prejudice that already exists and can have damaging consequences as documented in this report.’ I agree with you totally. But White working class people have to deal with low-wage jobs as a reality, and the nature of the class system in Britain allows some people to prosper if they are from the ‘right’ background, have the ‘right’ accent, have the ‘right’ connections, live in the ‘right’ areas and so on. Why when White Working class people are prejudiced about immigrants there is outrage, but when White Middle class people are just as prejudiced in their own little way is there a resounding silence? Let’s tackle ALL prejudice, or in the end you tackle none of it. Tim Childs has fallen into the trap of believing that no native Briton has a low paid, unrewarding, ‘menial’ job, I can assure him that Millions of British people are slogging their guts out for a pittance, I no longer have to (fortunately) but during my student days I worked a night shift in a factory and ironically enough many British people are working in the exact same factory and no doubt many still will be in another 30 years time. I have recently moved from London Peterborough. I can see a vibrant presence of East European people mainly around the Peterborough City centre. I am British but of South Asian origin. I have been living here since April but yet to see any hostility from the local white population. Perhaps I need to wait.